The chickens spent the first night in their coop last night — we still need to build the fence, but the Carpenter came by and put the door on, and built a ramp for them — I think we’re putting the fence in tonight — they are very funny — they like exploring around, but they’re chickens, they’re not very brave. 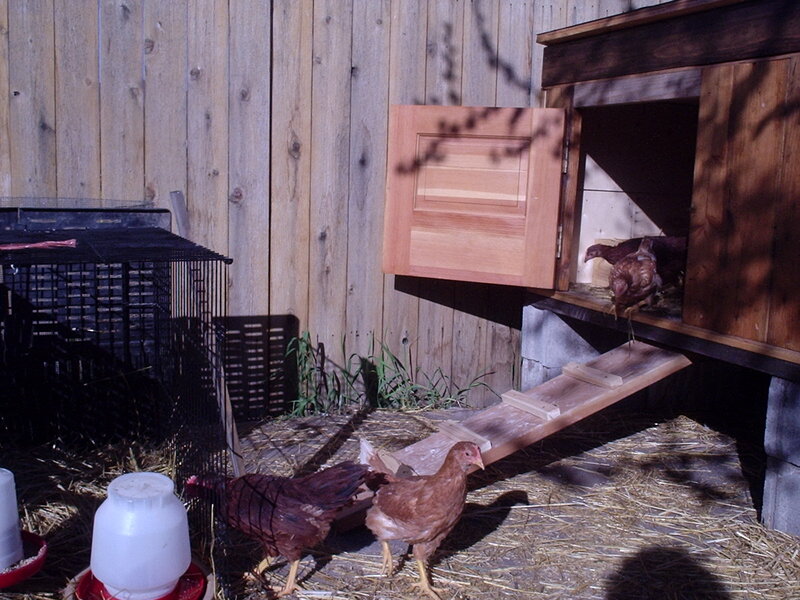 So this morning they poked their heads out of the coop, and negotiating the step to the ramp seemed very daring for most of them — the rooster of course was the first one out, checking out the scene for his girls. Eventually though they all made it down the ramp, and back into their dog crate (which is there to protect them from the dogs). I’ll have to reposition the plastic things (formerly the bottom of a composter) so they’ll have a little shade — it’s supposed to be 80 degrees today and I’d hate to roast the little guys. 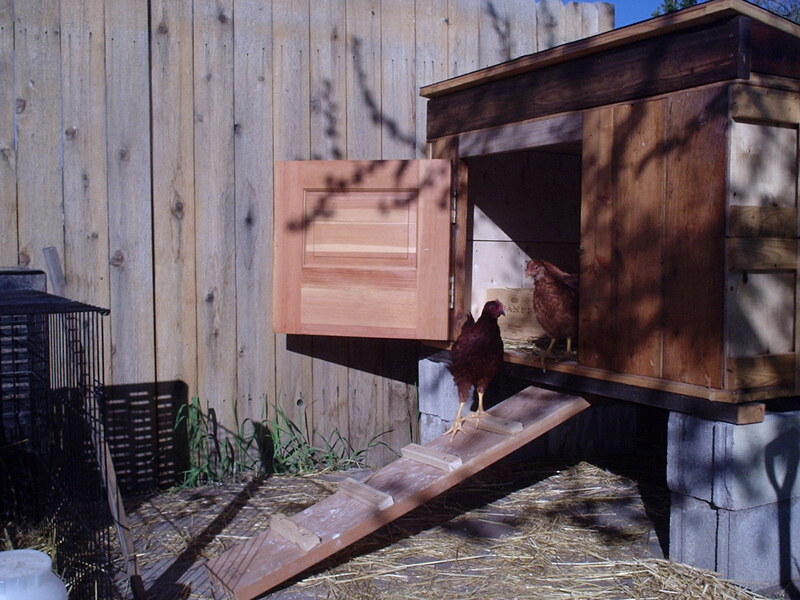 The chicken coop is made from a packing crate — my friend Sabrina had some family things shipped over from England, and the crate was so beautiful that we decided to recycle it. The Carpenter had some old doors he’d used for closets, so there’s a door, and of course, he has a plethora of lumber. He also found an old temperature-sensitive foundation vent, which you can’t see in these photos but which he put on the side of the coop for ventilation. It closes when it’s cold, opens when it’s hot. The whole thing is up on cinder blocks so they’ll have a shady place to hide on a hot day. I recycled an old wooden wine box I found at the dump as a laying box, and the Carpenter is bringing over some old broom handles to put in as roosts. Then as soon as we get the fence in, they’ll be a little more free range than they have been. The dogs are off to the groomers this morning for their spring shave, so I think the chickens might get some free time in the yard while they’re gone.